Although the weather remains more clouds than sun, the temperature has been inching up week after week and the garden is progressing. Yesterday, I picked 3 pounds of strawberries from the strawberry patch. This was from the old patch that badly needs to be rebuilt. I’d love to have three times the growing space for strawberries. I have the room, but it will require us to make progress on a garden expansion south of the orchard. I hadn’t realized that I had so many strawberries ready to pick when I went to the farmers’ market earlier in the day. I assumed I wouldn’t have enough for jam, so I bought a flat of strawberries. It actually worked out well because I made a pretty large batch of jam and still had strawberries left over for fresh eating. To make the jam, I used the Ball “no sugar needed fruit pectin.” I like this kind because it allows me to use as little sugar as possible, both to keep the jam healthier but also to avoid making the jam cloyingly sweet. I like jam to retain as much of the natural fruit flavor as possible and even have a bit of tartness to it. This tastes much better to me than an overly sugared jam. A few weeks ago, I posted about the new chicken coop my brother-in-law Jeff built for us. After the coop was finished, I decided that it would be a good idea to build a run off the side of the coop. It took us a few more weeks to get the run finished but the ladies were able to move into their new home yesterday. The coop is in the goat pasture and the goats have been curious about their new neighbors. We have a little more work to do dog-proofing the large pasture fence with barbed wire, but that should be done today and then we’ll let the ladies out for some time in the pasture. This entry was posted in Gardening, Homesteading, Livestock and tagged chickens, goats, strawberries. Bookmark the permalink. The strawberries and jam look delicious. 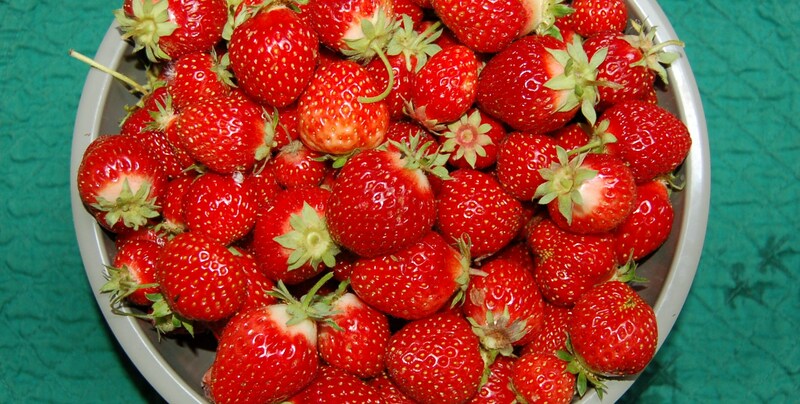 Our strawberries are all green still – darn weather this year! The coop and new covered run area looks really good. It’s great that you can pasture them out into the bigger field.